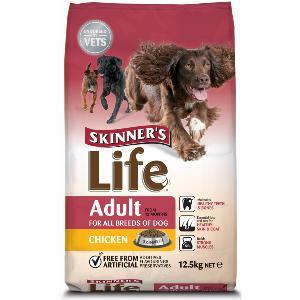 Skinners Life Adult Chicken is a specially formulated food suitable for all breeds of adult dog. It contains easily digestible chicken that provides the correct level of protein for the maintenance of strong muscles, teeth and bones. The high levels of essential fats and oils help to maintain a healthy, glossy coat and ensure your dog’s skin is also in great condition.